Research company CB Insights analysed the private market fintech investment activity of the top European banks and their venture arms, by assets under management (AUM), from 2012 to Q2 2018 (as of 11 April 2018). 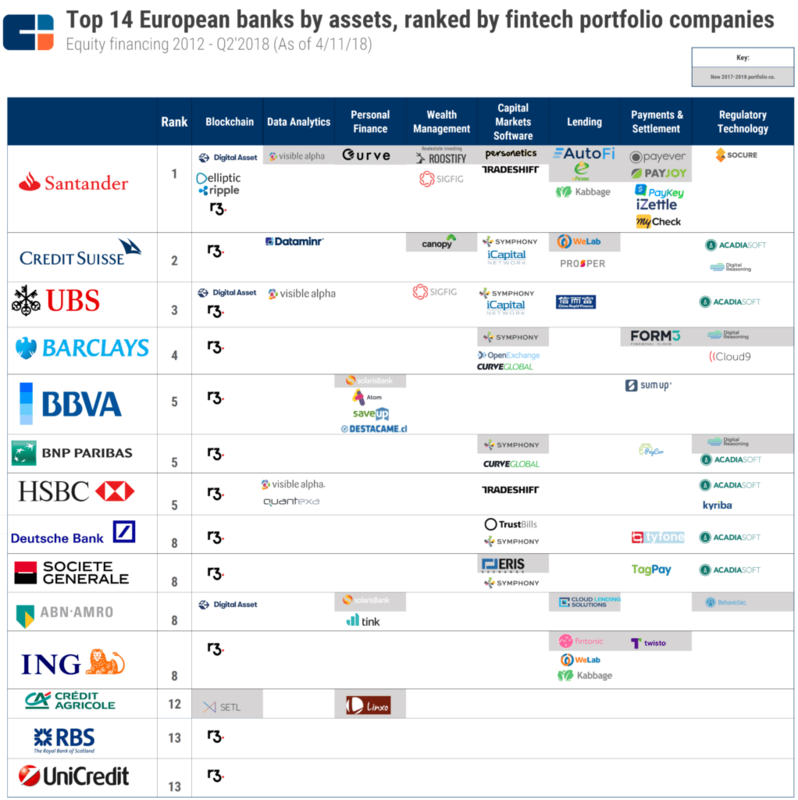 According to the graphic below, created by CB Insights, European banks are placing strategic bets across wealth management, lending, payments and regulatory technology and also blockchain. Ranked by the number of unique portfolio companies, the cohort’s most active investors are Santander, Credit Suisse and UBS (in that order). Santander leads mainly through its venture arm, Santander InnoVentures. The firm has made 23 equity investments to 19 unique fintech start-ups. The largest investment it participated in was a $135 million Series E investment in Q3 2015 to SME lender Kabbage (which also included participation from ING, among other investors). WeLab raised the largest investment that included this cohort, a $220 million Series B-II in Q4 2017 that included participation from Credit Suisse. ING is also an investor in WeLab and participated in its $160 million Series B investment in Q1 2016. The company with the most co-investments in this cohort is R3, founded by a consortium of banks and financial services firms and developing use cases for blockchain applications. The company raised a $107 million round of financing in Q2 2017 that included participation from HSBC, Credit Suisse, BBVA, Societe Generale, ING, Deutsche Bank, Royal Bank of Scotland (RBS), UBS, BNP Paribas, and Barclays Bank, among others. In the last five quarters, this cohort has been pulling back on blockchain investments. Credit Agricole made the only new blockchain investment, an undisclosed investment to SETL. Further, this cohort only made one follow-on investment, in the aforementioned R3. Instead of blockchain, the investment focus is now shifting to capital markets technology. Communications and collaboration platform Symphony Communication Services has seen the most investment participation from this cohort in the capital markets tech space. Symphony, already a unicorn (over $1 billion valuation), raised a $67 million Series D in Q2 2018 that included Barclays. This was Barclay’s first investment in Symphony. BPCE and Credit Mutuel Group in France, and Lloyds Banking Group in the UK have not made any equity investments to fintech start-ups during this period and are not included in the graphic below. Santander is listed as an investor in R3. This is not the case. HSBC is an investor in Symphony, which is not depicted in the graphic. Bank says app is popular among freelancers and micro-enterprises in the UK. Philippine paytech finds lots of friends as it readies for US launch. "The UK is the most mature market in Europe for crowdfunding and P2P lending." End of an era and not all employees will get a job at the Indian firm. Five-year tech agreement includes AI, blockchain and big data plans.